You’ve heard the news and have been overwhelmed by the advertising blitz. Smart homes are all the rage, but why should it matter to you and how do you get started? What’s The Future Of Smart Home? Why Do I Want A Smart Home? Simply stated, products that are smart are designed to make your life easier and more automated. A smart product allows you to control virtually any device in your home from your phone or other gadget, even when you’re not physically at home. You can also set schedules, reminders, and more – for example, a smart refrigerator could tell you when you’re running low on yogurt and automatically add it to your digital shopping list. The growth of this technology is expanding rapidly and changing daily! Stay on top of the latest trends by visiting and bookmarking our smart home statistics & predictions article. The closest you are going to get to having an entirely smart home is by using a home automation service. This is a more expensive option, but you can have a company outfit your entire house, essentially making it a one-stop shopping experience. Learn more in our best smart home technology article. For the more budget and DIY minded, you can get your own smart home hub, a product that allows smart devices to connect to each other. So, while they won’t provide as integrated an experience as the whole home automation services mentioned above, starting with a hub is the next best option, and may be the best option if you’re into DIY. Read our best smart home hub article to learn more. 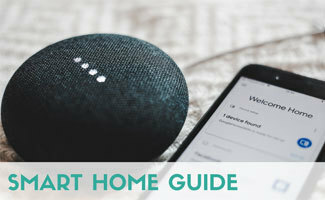 You can also use a smart speaker like Amazon Echo or Google Home to act as a “smart hub.” But know that you can only control your gadgets this way via voice, ie. audio questions (or via their respective apps). Additionally, all connected devices must be compatible with your smart home device (which many are now). Clear as mud? If you want a simpler way to start, try using Wemo plugs or switches to “smarten up” your existing appliances and gadgets. What Smart Home Gadgets Can I Add To My Home? We’ll continue updating and adding to this list as we review more smart products entering the market. See one missing you’d like reviewed? Let us know in the comments. Below the list we detail how these smart gadgets are typically used. The most common place to start with upgrading your smart home is with the lights and smart thermostats (like the Nest). You’ll recoup your investment on many of these given the energy savings (you can even get a rebate for your thermostat in some cases). From there, you might consider upgrading your floor cleaning game with a robot vacuum or a smart mop. They clean your floors and do the heavy lifting for you. They don’t typically work with home automation systems or hubs (yet) but you can set them on a timer to clean regularly (or when you’re not home). In the bathroom, you can add a smart scale that integrates with your fitness trackers and keeps your health in check. Use a smart toothbrush to keep your teeth pearly white and get a deeper clean. Smart home gadgets aren’t limited to the indoors either. You can use smart sprinklers to ensure you are watering your yard at the proper time of day and optimizing water usage. Garage openers are also getting smarter (and we’ll review those soon, stay tuned). Another cool tool we love (and use) are key finder apps, which you can attach to your keys (or bags, dog, etc.) to keep track of their location via Bluetooth. No more wondering “where are the keys?” anymore! Finally, with all this smart home technology, you’re going to need super-fast internet to keep everything online and working. We recommend looking into getting a WiFi extender or repeater to help boost your internet connection throughout your home. The options are endless. We’ll continue to stay abreast of the latest and greatest on the smart market. This handy infographic we created that can give you a better idea of all the places you can use smart home devices in and around your house. Check out this CNET video which takes you behind the scenes of a smart home and shows you some of the best gadgets in action. Hey Alexa, What’s The Next Smart Home Gadget? What’s the future of Smart Home technology? Only time will tell. Robots are already hitting the market, so who knows? Maybe kids will start having less chores around the house soon. Want the coolest smart home gadgets we’ve found to enhance your bat cave that won’t break the bank? Check out our 5 coolest smart home gadgets article for the scoop! Sadie has a bachelor’s in communications and minor in business from the University of Texas at Austin. She has been writing about, researching and a user of security and smart home technology since 2012. As an early adapter and avid user of gadgets, she’s not only well-versed in how to use them but also passionate about helping others integrate them into their lives and homes. Having lived in various urban neighborhoods in major cities like Dallas, Austin, Winston-Salem and currently Washington DC, Sadie has experienced her share of property crimes over the years; from car break-ins to stolen bikes. As a result, she’s extra cautious when it comes to protecting herself and her property. Sadie attends conferences, events and webinars to stay up-to-date on cybersecurity and technology. She loves traveling the world and is a self-proclaimed Apple junkie.